In the first of a series providing comprehensive descriptions of the sons of Samuel-II Gentry, his son Nicholas is described, along with a summary of his children with a sampling of pertinent references to those family members. The current article initiates a series of articles on the sons of Samuel-II Gentry by providing almost all of the references to Nicholas-III Gentry known to the author. An interpretation of those references where appropriate, and an outline of the conclusions drawn from the references is provided. As in preceding articles, such conclusions have been based upon reasonable and "informed" probabilities in interpreting the data. The opinions expressed are those of the author and his responsibility alone. – died probably 1800 in Surry County, North Carolina. i. Nicholas Gentry (speculation), born about 1744, Louisa County, Virginia; married Elizabeth Gibson (in South Carolina? ); died about 1783, Davidson County, North Carolina (later Tennessee). ii. Samuel Gentry (speculation), born about 1748, Louisa County(? ), Virginia; married Frances [Unknown], (in South Carolina? ), died 1819, Spartanburg District, South Carolina. iii. Allen Gentry, born about 1751, Lunenburg County, Virginia; married about 1777, Surry County, North Carolina to Elizabeth Waddell; died 1825, Wilkes County, North Carolina. iv. Arthur (Artha/Athey) Gentry, born about 1754, Lunenburg County, Virginia; died 1851, said to be in Alpharetta, Cobb County, Georgia (now Fulton County). vi. Agnes Gentry (probably), who married Amariah Felton, (marriage bond, 29 Sep 1788, Surry County, North Carolina); born approx. 1758 (speculation), Lunenburg County, Virginia. vii. Jane Gentry (probably), who married Jacob Lyon, (marriage bond, 3 Jan 1788, Wilkes County, North Carolina); born approx. 1761 (speculation), Lunenburg County Virginia; died bef. 1840, Wilkes County, North Carolina. viii. John Gentry, born about 1764 (speculation), Lunenburg County, Virginia; married Ruth [Unknown] [some sources give maiden name Bodan]; died 1835, Campbell County, Georgia. Like all of the sons of Samuel Gentry, there is no documentary evidence anywhere which specifically relates Nicholas to this family. Other evidence based upon the association of Nicholas with Samuel and with the other presumed sons of Samuel is so overwhelmingly conclusive, that there can be no question that Nicholas was a son of Samuel (see also JGG, vol 1, issue #7, July 2001). As to Nicholas' placement among Samuel's sons, the order of appearance of deeds relating to Nicholas, and the apparent ages of his children compared to the apparent ages of the children of his siblings suggest that he was the oldest of Samuel's children. Nicholas' first appearance in the records of Louisa County, Virginia, has been the source of an enormous amount of confusion. Nicholas is recorded in 1743 as being the husband of Mary Brooks, daughter of Richard Brooks, the latter of whom deeded 100 acres of land along Dirty Swamp<1a>. This is clear enough, but the problem arises in the fact that there were three Nicholas Gentrys living in Louisa County at the time. This deed was issued to "Nicholas Gentry the Younger", which identifies the recipient as Nicholas the son of Samuel. Other deeds refer to Nicholas Gentry Senior and to Nicholas Gentry Junior as a way of distinguishing the three (for example, refr. 2a). Nicholas Gentry Senior was a brother of Samuel and a son of Nicholas-I. Nicholas Junior was a son of Nicholas Senior, and thus a first cousin of Nicholas the Younger. Gentry genealogists who have not paid attention to these distinguishing designations, or have access only to an unqualified statement, "Nicholas Gentry married Mary Brooks", have assigned Mary as a wife to both of the other two Nicholases. Both of these have received much more prominence in genealogy literature partly because they are both included in Richard Gentry's "The Gentry Family in America" (GFA), and because both of these remained in Louisa County for most of their lives, and their children have received more attention than have those of Nicholas the Younger. Regardless of the causes, the number of erroneous references to Mary Brooks in Gentry family trees far outnumbers correct references. 1747 Nicholas bought 108 acres along the Meherrin River from Robert Brooks<1c>. 1748 Nicholas appears in first list of tithable residents of Lunenburg County<4>. 1766 Nicholas and Mary sold 28 acres of their original land holding to Aaron Droman<1d>. 1767 Nicholas and Mary sold 80 acres of their original land holding to Thomas Maury<1e>. Lunenburg County was formed from Brunswick County in 1746 as a very large county that originally encompassed ten counties into which it was eventually divided. The availability of new, unsettled land undoubtedly was responsible for all of Samuel's family moving over a period of time from Louisa County to Lunenburg County. Nicholas appears to have had an agreement with Robert Brooks (who was probably a younger brother of his father-in-law Richard Brooks) to go together to Lunenburg County and to cooperate in settling new land there. Robert Brooks was the one who received a formal grant from the Crown for land which is believed to have been on both sides of the North Meherrin River at the junction of the North Meherrin and Reedy Creek (see Fig 1). Robert received a grant for 630 acres in a patent dated 25 Jun 1747<2d>. Two weeks earlier he had already deeded 108 of these acres to Nicholas and Mary Gentry. A year later, Robert deeded another 130 acres on the north side of the Meherrin River to a Richard Brooks<2e>. (Other records suggest that this Richard was not Nicholas' father-in-law but was Robert's son. Robert's brother also moved to Lunenburg County, but somewhat to the north of Robert along Reedy Creek.) As indicated in the chronology above, Nicholas was included in the first list of tithables recorded for Lunenburg County, along with Robert and Richard Brooks and also with Nicholas' uncle, David Gentry, and his brother, William Gentry. A variety of records can be found for Nicholas during his time in Lunenburg County, a number of which include him as a witness to deeds or as being an adjoining land owner. The only deeds involving him as a grantor or grantee, other than the original deed of 1747, were in 1766 and 1767 when Nicholas and Mary sold their land and left the county. The acreage of the land sold, and the fact that a 1764 tithables list shows Nicholas with 108 acres, indicates clearly that once he settled in a spot, he was not one to repeatedly move from one location to another. The only other records involving Nicholas are a handful of County court references<3>. In 1755, Nicholas and Hezekiah Gentry appeared in court where they acknowledged a debt which was to be repaid in 2 months. In 1757, Nicholas and his brothers Joseph and Simon, along with others, were assigned road maintenance duties. Similar road responsibilities were assigned in 1765 to Nicholas, Joseph and Richard Gentry. Two other court cases in 1764 and 1765 involved Nicholas standing bail for John Colvin in a case involving a debt and Nicholas receiving judgment as the plaintiff in another case. To complete the enumeration of Lunenburg references, Nicholas was mentioned as a creditor in two estate settlements, one in 1761 for William Dobbins, and a second one in 1763 for Henry Cockerham<4g,h>. 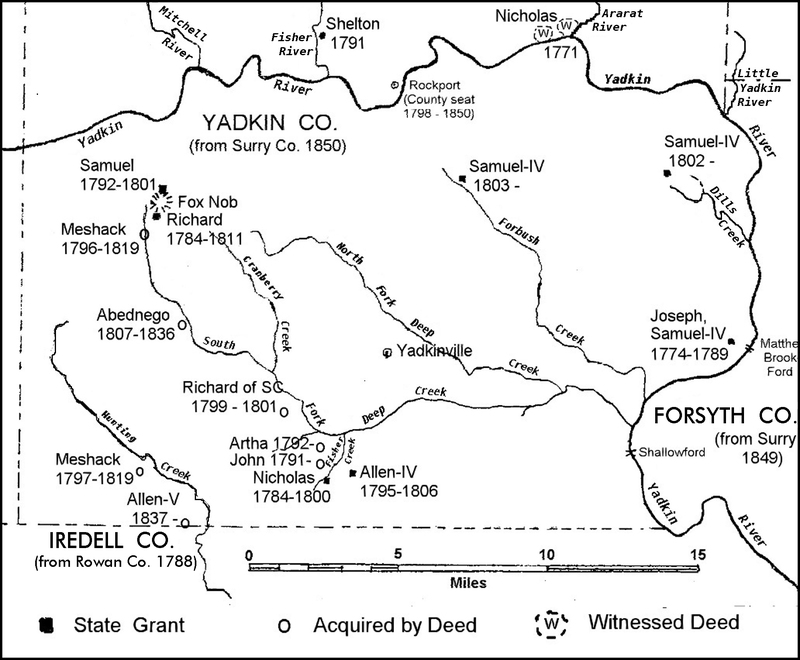 1771 Nicholas witnessed two deeds for land located on the north side of the Yadkin River in the vicinity of Arrarat Creek (for example, refr. 2k). 1771 The first of many references in Surry County tax lists to Nicholas and his family<5>. 1784 Nicholas received a state grant for 200 acres on the south side of Fishing Creek, [in the south half of Surry County]<1f>. 1785 Nicholas, "an aged and infirm person", exempted from paying poll taxes in the future<3i>. 1787 Nicholas deeds 100 acres of his 1784 grant, to Blunt Garrett<1g>. 1789 Two state grants to Nicholas of 240 acres and 150 acres on the south fork of Deep Creek<1h,i>. 1792 Nicholas deeds 100 acres of his 1784 grant, to Artha [Arthur] Gentry<1k>. 1800 Nicholas deeds 150 acres of land on Deep Creek to Allen Gentry<1r>. 1800 Nicholas deeds 240 acres of land on Deep Creek to John Gentry "for natural love and affection of parents for child"<1s>. In leaving Lunenburg County, Nicholas once again appeared to be the leader in prompting resettlement of his siblings in new surroundings. A year after he sold the last of his Virginia land, he is recorded as being in another area of brand-new settlement. Nicholas joined a large influx of small, independent yeoman farmers who flooded into Rowan County, North Carolina, which brought about a division of the county in 1770 into a number of new counties that included Surry County. Nicholas was accompanied by his brother Joseph (who had not yet sold the last of his land holding in Virginia) and by his nephew Hezekiah. The latter moved on to new surroundings, probably joining his mother and brothers in South Carolina at that time, but Nicholas and Joseph appear to have explored different potential homesites. Nicholas, at least, is known to have lived briefly along the Yadkin River in the northeast corner of present Yadkin County near the junction of the Arrarat River with the Yadkin, before moving on to the southern part of the county where he eventually settled permanently. Joseph may have been with Nicholas along the Arrarat, but by 1774, he had also settled in a location farther south along the Yadkin River. The location of the land grants to Nicholas and of the first land holding of Joseph Gentry can be seen in Fig 2. which is based upon a map published in Yadkin County by The Custom House showing the location of state grants in the county. The land held by Nicholas and his sons Allen and Artha (Arthur) was close to the main road across old Surry County that led from Shallowford, on the Yadkin River, to points west and south. An examination of the deeds in which Nicholas was involved shows a discrepancy of 150 acres which he deeded to his son Allen for which we do not have a record of acquisition. This may be the 150 acres of land for which Allen was taxed in 1782, and identified as being along Deep Creek. He may have obtained this land by direct purchase in a deed that was never recorded rather than as a state grant. The timing of the tax list was one in which taxation was taken over from the former colonial government by the newly formed state during the time of the Revolutionary War. There are no existing or surviving tax records for the period between 1775 and 1782, so we have no clue from this source, as to when Nicholas may have acquired these 150 acres. The deeds indicate that the land on which Nicholas settled, and which was extended by two succeeding grants of neighboring land, remained in the family for the rest of his life. This is in keeping with Nicholas' behavior in Virginia of finding a spot to settle and then sticking with it. Nicholas continued to appear on an almost annual basis in the extensive Surry County tax lists, from the time of the resumption of such lists in 1782 until 1796. Beginning in 1785, Nicholas was taxed for his land but was not assessed a poll tax thanks to a court order in that year in which he was exempted from further poll taxes. The two deeds disposing of the last of his land to his sons Allen and John in 1800 appear to be in anticipation of death. We find Nicholas and his family in a 1786 North Carolina state census (coincidentally the only Gentrys that were included), and in the 1790 federal census<7>. His sons Allen, Artha, and John are in the 1800 census (the returns for which were signed in April 1801) but Nicholas is missing. The assumption is that he probably died during the year 1800. There are no existing records showing estate settlements or payment of creditors. His estate must have been minimal in any case as he appears to have disposed of all of his land to his sons by 1800. At the end of his life he probably was living with his son John, and had no independent household effects. Nicholas' wife Mary is never mentioned in any North Carolina records, but appears to have been present with Nicholas in the 1786 and 1790 census reports. We find no evidence of an elderly woman in any of the Gentry family households in the 1800 census listings, so the presumption is that she died a few years before Nicholas. The fact that Mary never appeared in any of Allen's deeds, relinquishing dower rights, may have been simply a case that North Carolina was not as particular about this legal nicety as Virginia and South Carolina, or may be a case of Mary having died before 1792 when Nicholas sold the first portion of his land. Mary Brooks, Nicholas' wife, and Sarah Brooks, David's wife, were both daughters of Richard and Elizabeth Brooks. Other members of the extended Brooks family also were closely associated with the Gentry family. They appear to have descended from a Richard Brooks Sr. whose will was probated in Hanover County, Virginia in 1734. (We will refer to him as Richard-I). In this will he bequeathed his estate to his wife, Mary (Gibson) Brooks, sons William, Richard, and Robert, and daughters Sarah and Massilina. This son Richard was undoubtedly the Richard Brooks Jr. (Richard-II, see chart below) to which reference is made in a number of Louisa County land grants and deeds, including the grants of land on Dirty Swamp to Samuel Gentry and to Nicholas-II Gentry (see refr. 2 for this and other deeds involving the Brooks family). The deeds also identify his wife as named Elizabeth. This same Richard moved to Lunenburg County at the same time as the Gentrys and is referred to there as Richard Sr. In turn this Richard was the father of a third Richard (Richard-IIIa, who died young in Lunenburg County and who was married to Susannah), and the father of Elisha Gentry (whose wife was Frances). Elisha and his cousin Richard (Richard-IIIb, son of Robert) filed for a land grant in South Carolina in 1766 at the same time as Richard's daughter Sarah Gentry. Richard's brother, Robert-II, appears to be the individual who filed for a land grant in Lunenburg County and who turned around and sold a part of the grant to Nicholas Gentry. Robert must have been the father of the fourth Richard (Richard-IIIb, whose wife was Lucretia), to whom he sold land in 1748. Robert apparently moved from Lunenburg County to Halifax County, Virginia, as he was identified in 1763 as being from there, at the same time as he sold part of his land to Artha Brooks. A Matthew Brooks is also found in Lunenburg records and witnessed one of the deeds in which Nicholas sold the land he had originally purchased from Robert Brooks. Both Artha and Matthew were probably sons of Robert-II. Matthew Brooks moved to Surry County at about the same time as the Gentry brothers, and was closely associated there with both Joseph and with Nicholas. As will be seen in a forthcoming article, it is very probable that a daughter of Matthew married Joseph's oldest son, Samuel-IV, thereby tying the two families even closer together. A John Brooks who bought David Gentry's land in Louisa County was probably the same John Brooks who later moved to Lunenburg County, bought land there, and appears in Cumberland Parish records along with William and Allen Gentry. Later, he was listed in the census of taxables in Caswell County, North Carolina, at the same time as Allen, Samuel and Shadrack Gentry. Eventually his daughter, Elizabeth, married Abednego Gentry. He probably was a son of Robert-II. To further confuse matters, in the St. Paul's Parish processioning records in 1712 and again in 1716, there are listed "Rob't Brooks orphans" who were listed as land owners in the same precinct as Richard Brooks. These could not have been children of Richard-I because his will was written many years later. Perhaps Richard-I had a brother, Robert-I. Children of this original Robert Brooks, are thought to have moved to Brunswick County, Virginia, (from which Lunenburg County was formed) and to Halifax and Mecklenburg Counties. Members of the various Brooks families were present in Halifax County at the same time leading to considerable difficulty in distinguishing between them. For the most part, Nicholas and Mary's children have not been fully recognize by the genealogy community. Three sons and two daughters who were present with Nicholas in North Carolina are very easily explained as being children of Nicholas. We suggest that three other sons, Nicholas Jr., Samuel and Richard, who did not remain in North Carolina but moved on to South Carolina, were also sons of Nicholas. It is interesting that their brothers Arthur and John both moved to South Carolina eventually also. As is true for all of the children, there are no records in Virginia that refer to them, and all the evidence concerning them dates from after the time of their move from there. Tax records in Surry County 1771 have a record for a Samuel Gentry in the same tax district as Nicholas Gentry<5>. We suggest that Samuel was a son of Nicholas who was with him briefly when he moved to the southern part of Surry County. Samuel apparently left in 1772 going to Spartanburg District, South Carolina, where he spent the rest of his life. The Surry County tax record is by no means unambiguous because Nicholas had two younger brothers of the same name, both of whom appeared later in Surry County records but in a different tax district than Nicholas. To further complicate matters, a third Samuel that appeared in early Surry County records was the oldest son of Joseph-III Gentry. The upshot is we cannot definitely say that this Samuel was a part of Nicholas' family, but there is a very good possibility of it being so. Records of Samuel Gentry's presence in Spartanburg District, South Carolina, date from the 1790 Federal census until his death in 1819. Based upon the ages of his children, we estimate Samuel's year of birth as approximately 1748 to 1750. At the time of the 1790 census, there was an older Samuel Gentry also living in Spartanburg District. This was Samuel-III, youngest son of Samuel-II Gentry and the younger brother of Nicholas-III, who lived in Surry County for a number of years and received a state grant of 400 acres there. This land was sold in 1801, at which time his sons returned to North Carolina, and were identified in the deed of sale as "Allen Gentry, Nicholas Gentry, Jeremiah Gentry and Samuel Gentry, joint heirs of Samuel Gentry, dec'd, of the State of South Carolina". In discussions of the two older Samuel Gentrys, the writer uses the designation, "Samuel Gentry the Younger" for the Samuel born about 1750, and "Samuel Gentry the Elder" for Samuel-III who was born about 1738. Both Samuels had sons also named Samuel, but fortunately for the purposes of identification, the son of Samuel the Elder left South Carolina about 1800 and moved north to Kentucky and then Indiana. The name "Samuel" was rather unique in the Samuel-II family as none of his brothers, including David-II Gentry whose descendants also lived in South Carolina, used it for naming children or grandchildren. This leads to the supposition that Samuel the Younger must have been part of the family of Samuel-II, and the only member of that family that could have had a son the age of Samuel the Younger was Nicholas-III. Like Nicholas Jr, further discussion of the life and family of Samuel the Younger will be covered in other issues of this journal. Allen was present in Surry County at the time of the 1800 census, and land records show he owned land there until 1806. Some time in that interval, probably about 1802, when he sold what appears to have been his original homestead, Allen moved to Wilkes County where he lived the rest of his life. His will was filed for probate in January 1825 and names only his wife Elizabeth despite the existence of known living children<8>. It is probable that he had only a minimum of assets by that time, and left only his personal possessions to Elizabeth. Early land records are very spotty for Wilkes County, but it is known that his son Jonathan settled along Big Elkin River in Wilkes County and it is probable that this is where Allen lived also. Allen's sons Jonathan, Matthew, Arthur, and Nathan all lived in Wilkes County throughout the balance of Allen's lifetime. Matthew and Nathan moved back to Surry County by the time of the 1840 census, while Jonathan and Arthur remained in Wilkes County. The 1790 Surry County census suggests that Allen had a fifth son who did not survive to 1800, and that he had three daughters who did not survive to 1800 or more likely, married in the intervening time. One unnamed daughter lived with Allen and Elizabeth until the time of the 1820 census, another daughter, Mary (Polly), married Valentine Lyon in 1816 in Wilkes County. Arthur's name was spelled phonetically in North Carolina in quite a variety of ways -- Artha, Arthey, Atha, Athe, Athey etc, When he moved to South Carolina, his name was spelled "Arthur" more often. He appears in the Surry County records beginning with the tax records of 1772 (as a second unnamed tithable individual in his father's household) and 1774 (in which he is named individually). From 1782 onward, his name appears regularly until a final entry in 1806. He apparently lived with his father until 1785 as he was listed adjacent to Nicholas during his early years with no taxable land being listed. Beginning in 1786, Arthur was listed in a separate tax district from Nicholas and Allen, and was taxed regularly for 100 acres of land, for which there is no record of purchase or grant. In 1799, Arthur received a grant of 200 acres State land<1o>, and in 1802 he purchased 200 acres more land on Forbush Creek<1v>. Arthur sold this last parcel in 1808<1z>, but there is no record of when or how he disposed of the rest of his property. The last tax listing for Arthur was in 1806, at which time he was taxed for his property, but not assessed a poll tax, leading to the presumption that he was no longer a resident of Surry County. Arthur moved to Pendleton District, South Carolina with all of his existing household, but was probably preceded by several years by his daughter Leah and her husband John Fretwell. As will be seen shortly, Arthur's brother John also moved there, so by 1810 none of Nicholas Gentry's descendants remained in Surry County. Pendleton District was reorganized into Anderson District and Pickens District in 1828, Arthur lived in the part that became Anderson District. He was listed continuously in the South Carolina census records until 1850, in Pendleton District in 1810 and 1820, and in Anderson District in 1830, 1840, and 1850. His age was listed as 94 in 1850. There are no land records for him during this time. His will, written in 1849, mentions no land, so whatever he had earlier, he must have already passed on to his children. Arthur is said to have died in 1851 in Alpharetta, Georgia (in Cobb County at the time, but now a part of Fulton County). What this 95-year-old man was doing there is unclear. He may have been moving to Georgia, or he may simply have been visiting grandchildren who were living in Cobb County at the time. In any event his legal residence appears to have still been in Anderson District since this is where his will was filed for probate. Most of Arthur's children can be identified from his will<9>. One older son, Elisha, not mentioned in the will, died before 1820. He can be identified from his appearance in North Carolina records as a witness for Arthur, and in his marriage to Seneth Denny <6>, and by extension, by the appearance of members of his family in Anderson District, South Carolina, census records. Another older son, likewise not mentioned in the will, is believed to have been a John Gentry, but solid evidence for this is lacking. A third child of Arthur, not mentioned in his will was his oldest daughter, Leah, who married John Fretwell in Surry County in 1801 <6>. (Her husband died in 1847 in Anderson District and Leah may have died before him). The surviving children were Rebecca (apparently handicapped in some manner since Arthur's will provided for special care for her), Daniel (married Mahala Hembree), Winnifred (married James Hembree), Tabitha (married John Vandiver) and Allen (wife unknown). Leah and Elisha both married in Surry County. Both John and Elisha were with Arthur at the time of the 1810 census, but neither one appeared to be living in 1820. Interestingly, Elisha went back to Surry County to marry Seneth (or Asenath) Denny, as their marriage bond was dated 1811. John appears to be the youngest of Nicholas' children, at least he was the last one to leave home. He also is the only one to be specifically identified as a child of Nicholas, being so named in the 1800 deed giving John 240 acres of land <1s>. His date of birth is very uncertain. Census records are of little help and show: in the 1786 state census, born before 1765; in 1800, born 1774-1784; in 1810, born before 1765; in 1820, born before 1775; and in 1830, born1770-1780. The 1786 date is taken from a census conducted by the State of North Carolina <7>, and John is the single male in the household who was over 21 and less than 60 years of age. John appears to be in the 1790 federal census with Nicholas, where two males over 16 years of age were listed. It is not certain, but probable, that by 1790, John had married and his wife, Ruth, was living in the household also, being one of the two females present. John received a grant of 100 acres of state land in 1791, located next to that of his father. This was land for which his mother's cousin, Matthew Brooks, had originally applied and which Matthew assigned to John<1j>. There was apparently a second assignment of 50 acres by Matthew in 1792 for which the formal grant has been lost, since it is mentioned in 1801 when John sold 390 acres (the two state grants, plus 240 acres given to him by his father in 1800<1u>). It appears that John must have left Surry County at about that time and followed his sister, Agnes in moving to Pendleton District, South Carolina, since there are no later tax or other records for him. Pendleton District records show that John bought 100 acres on 23-Mile Creek of Keowee River in 1802, but he sold it again in 1806. Thereafter, there are no more land records for him in Pendleton or Anderson County, although he appears in the 1810 and 1820 Pendleton census, and in the 1830 Anderson District census. There was an unidentified John Gentry who bought 100 acres of land along the Tyger River in Spartanburg District in 1826, and who witnessed several deeds between 1821 and 1826. This may have been Nicholas' son although if so, he did not remain in Spartanburg District. Some time after 1830, John moved from South Carolina to Georgia, settling in Campbell County. (This county was just opening for settlement, with land lotteries of former Cherokee land, and was organized as a county in 1832.) John died there in 1835, leaving a will<10> which makes special provisions for and mentions by name only three children, viz. Rhoda, Elias, and Wiley. A fourth child, Burgess, was named executor. His wife, Ruth, was mentioned but not named. The will does not at all exclude the children who were not specifically identified since Item 5 reads: "at the death of my wife my estate be equally divided amongst my children." Ruth survived her husband by many years as she was listed in the 1850 census for Gwinnett County, Georgia, at age 78. The unlisted children of John and Ruth (other than Burgess) have not been clearly identified, and we will not attempt to do so here, but census records suggest perhaps three other sons, and six daughters. Census records for 1786 (the North Carolina state census) and 1790 (federal census)<7>, and marriage bond records for Surry and Wilkes Counties<6> strongly suggest that Nicholas had two daughters who were living with him in 1786 and who had married and left home by 1790. One less female was present in 1790 than was in the household in 1786, which can best be explained by the two daughters being replaced by John's wife as indicated above. A Surry County marriage bond in 1788 for Agnes Gentry and Amariah Felton (a neighbor of Nicholas'), almost certainly was for a daughter of Nicholas. A second bond, in Wilkes County, for the marriage of Jane Gentry to Jacob Lyons, also in 1788, is more problematic. It is not clear what brought these two together, and why they were married in Wilkes rather than Surry County, but the timing is right. Moreover, the Lyons were ultimately closely linked with the Allen Gentry family, all of whom eventually moved also to Wilkes County. Two children of Jane's nephew Jonathan, Jonathan's brother Arthur, and their sister Mary, all married children of Jacob and Jane. For both daughters of Nicholas, it appears to have been second marriages for the grooms, since the 1790 census in Surry County showed Amariah with apparently six children, and Jacob in Wilkes County with apparently three children. Jacob Lyons continued to appear in the Wilkes County census until his death in 1840. This author has not specifically followed the movements of the Feltons, but Amariah sold land adjoining Nicholas' property in 1794 <1l> and moved to South Carolina. He and Agnes appeared in the 1800 census for Pendleton District, South Carolina, where John Gentry moved just a few years later. A quiet, unspectacular man, Nicholas Gentry fathered a family that became widely dispersed and that was always among the earliest settlers — from Virginia to the northwest borders of North Carolina, northwestern South Carolina, on westward into Georgia, and farther north into Central Tennessee and southern Kentucky. There are details of this family that remain unresolved, but the main features can be clearly distinguished from the record which they left. Robert Brooks to Nicholas Gentry, both of Lunenburg Co VA, for 12 pounds, sold 108 acres on both sides of Meherrin River, granted to said Robert Brooks and adj. to said Brooks. Recorded 6 Jun 1748. Nicholas Gentry and Mary, his wife, to Aaron Droman, both of Lunenburg Co VA, for 16 pounds, sold 28 acres, being part of a grant to Robert Brooks sold to said Gentry...Wit: Matthew Brooks, Richard Gentry. Recorded 9 Oct 1766. Nicholas Gentry and Mary, his wife, to Thomas Maury [Murry], both of Lunenburg Co VA, for 40 pounds sold 80 acres, being part of a grant to Robert Brooks, since sold to said Gentry, adj. Richard Brooks at river. Wit: Richard Gentry, Daniel Murray [Murry], Allen Gentry. Mary wife of Gentry relinq. dower rights. State to Nicholas Gentry 200 ac ... on the "south side of the Yadkin River" [in contemporary terms, this meant the portion of Surry County south of the east-west course of the river, in other words, this was in the south half of Surry County in the area that is now Yadkin County]... the south side of Fishing Creek, on a small branch, thence ... to the beginning. Nicholas Gentry to Blunt Garrett 100 ac ... being part of a tract of land surveyed for the said Nicholas Gentry containing 200 acres on the south side of the Yadkin River [at Fishing Creek] ... adjoining the said Garrot's [sic] plantation. Wit: Artha Gentry, James Badgett. State to John Gentry 100 ac on Deep Creek ... assigned land for which Matthew Brooks had made application, beginning near Nicholas Gentry's corner, then to Henry Speer's old line and to his corner, then to Nicholas Gentry's corner, then to beginning. Nicholas Gentry to Artha Gentry 100 ac ... being part of a tract of land surveyed for the said Nicholas Gentry, containing 200 acres on the south side of the Yadkin River...to south side of Fishing Creek... Wit: James Gadgett, Blunt Garrot. Amariah Felton to John Thos. Longino 312 ac on the waters of south fork of Deep Creek beginning at Nicholas Gentry's corner ... Wit: John Williams, Richard Gentry. Allen Gentry to William Jefary 103 ac ... on Deep Creek adjoining Felton's original line. Wit: Henry Hamrick, John Persons. State grant to Arthea Gentry 200 ac ... on the waters of Horn's Mill Creek beginning at said Gentry's former corner to Nicholas Horn's Mill, then northwesterly and back to beginning. State grant to Allen Gentry 50 ac ... on waters of Deep Creek beginning at his corner, north to his corner, then west along Henry Speer's line, then to Hambrick's line, then variously back to beginning. Nicholas Gentry to John Gentry 240 ac ... for natural love and affection of parents for child...on waters of south fork of Deep Creek, beginning at SW corner of his former survey, including both sides of a big branch and returning to the bank of said Creek, then ... to beginning. Wit: Thomas Wright, William Elliott. Allen Gentry to John Whaling 44 ac Deep Creek running southwesterly from the creek. Wit: Richard Jacks, George Person. John Gentry to Laurence Holcomb 390 ac ... being one tract surveyed for Nicholas Gentry and conveyed by him to John Gentry, together with another tract surveyed for John Gentry and entered for grant by Matthew Brooks, 29 Jan 1791 and assigned by him to John Gentry, and another tract entered for grant by Matthew Brooks, 28 Jul 1792, and assigned to John Gentry...on the waters of Deep Creek... Wit: Artha Gentry, Elisha Gentry. Thomas Lyon to Arthur Gentry 200 ac Big branch Forbis Creek. Wit: Laurence Holcomb, Stephen Dinkins (?). Allen Gentry to William Money 200 ac head waters Deep Creek. Wit: Richard Gentry, William Gentry, Richard Persons. Allen Gentry to Richard Persons 157 ac on Deep Creek adjoining Lansford, by the side of the mill pond and along a branch of said Creek. Wit: George Persons, William Money. Allen Gentry to Isaac Money 16 ac adjoining Person's corner, along a branch of [Deep] Creek ... to the beginning. Wit: Obediah Collins, William Gentry. 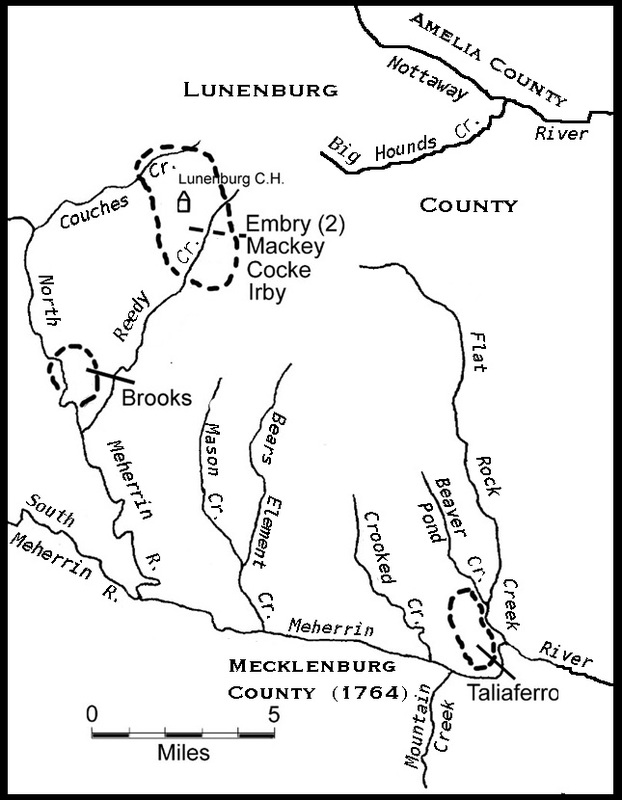 Artha Gentry to William Holcomb 200 ac on big branch Forbis's [Forbush] Creek. Wit: Laurence Holcomb, William Lyons. Edward Stringer deeds to Nicholas Gentry Jr. and wife Elizabeth [daughter of Edward Stringer], 70 acres of land on which Nicholas Gentry now lives on Gold Mine Creek. "Richard Brooks, Junr, [granted] 400 acres (new) Hanover Co., on both sides of Dirty Sw..."
Richard Brooks of Fredericksville Par., Louisa Co., Planter, for paternal affection for my son-in-law, David Gentry and his wife, Sarah Gentry, my daughter...100 acres on Dirty Swamp, Fredericksville Par. "Robert Brooks, [granted] 630 acs. Brunswick Co., on both sides of Maherrin Riv..."
Robert Brooks of Lunenburg Co to Richard Brooks of same place for 8 pounds, sold 130 acres on north side Meherrin river, originally granted to said Brooks. Recorded 6 Jun 1748. Richard Brooks of Fredericksville Par., Louisa Co., to John Starke ... sold 292 acres on both sides of Dirty Swamp ... part of 400 acres granted by patent to Richard Brooks 25 Aug 1731. Signed: Richard (R) Brooks. Ack 27 Jul 1748 by Richard Brooks, & Elizabeth his wife, relinq. her dower. Richard Brooks and Elizabeth, his wife, and Elisha Brooks and Frances, his wife, of Lunenburg Co VA to Everard Dowsing ... sold (blank acres), on both sides of Ready Creek adj. Joseph Jentry (Gentry), Wm Irby, land where said Richard Brooks lately dwelt, Richard Brooks, Junr, deceased, David Gentry and Cockerham. Wit: Moses Cockerham, Joseph Gentry, Nicholas Gentry, Robert Brooks. Signed: Richard (R) Brooks, Elisha (X) Brooks, Elizabeth Brooks, Frances Brooks. Richard Brooks and Lucretia, his wife, of Lunenburg Co to Daniel Price ... sold 130 acres, adj. ... Nicholas Gentry... Signed: Richard Brooks, Lucretia (X) Brooks. Francis Ray of Johnston Co NC to John Brooks of Lunenburg Co VA for 50 pounds, sold 197 acres ... mouth of Crooked Creek...Wit: William (A) Allin, William (W) Gentry, David (D) Gentry. Robert Brooks of Lunenburg Co VA to Artha Brooks of same place for 20 pounds, sold 100 acres, adj. ... Nicholas Gentry, Richard Brooks ... Signed: Robert Brook. John Bryan to Valentine Vanhouser 459 ac ... beginning on north side of Yadkin River, two miles above Arrarat Creek [River] then north, east, and south to the river bank by the mouth of Hogan's Creek, then along the river to the beginning. Wit: Robt. Lanier, Nicholas Gentry. Hampton Wade,Plt, vs Hezekiah Gentry & Nicholas Gentry, Defts. Plt came by his attorney, defts in person acknowledging debt. Assessed interest from April 6 last past. By consent of Plt, payment to be made in 2 months. John Hix appointed surveyor of road leading from Cal'v Wittons Road to Reedy Creek; ordered that Simon Gentry, Joseph Gentry, Richard Brooks, Elisha Brooks, Nicholas Gentry [among others] ordered to clear and keep in repair the said road. John Hix [with others including Simon Gentry, Joseph Gentry, Richard Brooks, Elisha Brooks, Nicholas Gentry, William Embry's male labouring tithables, Robert Brooks] ordered to keep in repair the road for which John Hix is surveyor. When the said road is cleared, William Embry is ordered to appoint such hands as he shall think fit to work on the said road with the said John Hix. Susanah Parsons, executrix of Joseph Parsons, dec'd vs Danile Price, in Debt. Plt came by his atty, and John Colvin and Nicholas Gentry came into Court and became Special bail for the Deft, whereupon Deft confesses judgment to the Plt. Order stay execution 'til Christmas next. Nicholas Gentry vs Matthew Wells, and attachment. Plt came by his atty, Deft came not. Judgment for the Plt. Everard Dowsing apptd Surveyor of the Road in Precinct of John Hix, following hands apptd a gang to work on said road and keep it in repair, to wit: [among others - William Embry, dec'd his estate, Joseph Gentry, Nicholas Gentry, and Richard Gentry]. Estate of Wm Dobbyns, account signed: credits include D. Gentry and Nicholas Gentry Recorded 2 Nov 1761. Estate of Henry Cockerham certified: credits include Wm Gentry, Samuel Gentry, Hezekiah Gentry, Joseph Gentry, Allen Gentry, Jos Gentry, Nicholas Gentry. Debits include Hezekiah Gentry, "Grah Briggs for his fee at a suit commenced per R Brooks Jr, Jos Gentry, Wm Taylor, Wm Dalton for Henry Cockerham Jr dec'd." Recorded 9 Jun 1763. Nicholas Gentry, an "aged and infirm person" exempt from paying poll taxes in future. Landon C. Bell, "Sunlight on the Southside, Lists of Tithes, Lunenburg County, Virginia, 1748-1763", Genealogical Publishing Co., Baltimore, 1974. (Ritchard Brooks adj] 1 tithe, 5 "heads & scalps"
David Gentry and Robert Brooks 2 tithes, 12 "heads & scalps"
Unless otherwise indicated, data for all Gentry names were transcribed by the author from original documents on file in the State Archives of North Carolina, Raleigh, NC. Originals are filed in the Archives by year of enumeration except for a few series of lists that are filed together as undated documents. By comparison of land holders, and format of the lists, some of the undated documents have been assigned tentative dates as indicated below. Refr 1. William Johnson,"Surry & Wilkes County Taxables, 1771-1777", vol 1, 1974. Refr 2. Mrs. Robert Taylor, "1782 Tax List of Surry County, North Carolina", Cimarron, Kansas, 1974. Refr 4. Luther Bird, transcribed 1771, 1774-5, 1784-1786, 1813 records, 1744 (filed with original records in State Archives files). Remaining records list only Nicholas Gentry or sons, other Gentrys in same districts omitted. Nicholas Gentry 150 3 horses, 9 cows; Yadkin R.
Entries are from Surry County unless otherwise identified. Allen Gentry: Wife Elizabeth; Exec. None; Wit: William Douglas, Artha Gentry. Arthy Gentry will signed 8 Sep 1849, proved/recorded 5 May 1851 in Anderson Co. before Herbert Hammond O.A.D. "I will and bequeath unto my beloved daughter Rebecca Gentry all my estate both personal and real...during her natural life...after her death I further will...32 dollars which is to be disposed as followes, to my son Daniel Gentry 8 dollars, to my daughter Winnifred Hembree 8 dollars, to Allen Gentry 8 dollars, and Tabitha Vandivere 8 dollars, as also to Winnifred Hembree one feather bed and furniture...I further will and bequeath unto my grandson Aaron F. Hembree...the remainder of my estate...yet nevertheless with this condition if the said A.F. Hembree shall continue with give due attention to and procure reasonable supplies for the comfortable support of me the said Arthy Gentry and my daughter Rebecca Gentry during our natural lives, but if he the said A. F. Hembree should make default and fail to comply with the above requisitions then and in that case I will and dispose of that portion of property which is above willed or allowed for him to be disposed of in the following manner (to wit) immediately after my death or the death of my daughter Rebecca which ever of us may be the longest liver...be equally divided between my fore children to wit Danniel Gentry, Allen Gentry, Winnifred Hembree, and Tabitha Vandivere. I constitute, appoint, and ordain James Hembree to be the Executor of this my last will and testament..."
"I John Gentry of the County and state aforesaid being in delicate health and knowing the uncertainty of human life and being desirus of having my worldly goods and property disposed of in my own choosing and liking do therefore make ordain and publish this writing my last Will and Testament. Item 1st. I commit my Soul and body to God my Creator putting my trust in Jesus Christ my Redeemer for life and Salvation Amen. Item 2nd. My Will further is that all my Just debts be paid out of my estate. Item 3rd. My Will further is that my two Sons Elias E. Gentry and Wiley R. Gentry each of them have one bed and furniture to make them equal with the rest of my children. Item 4th. My Will further is that the balance of my estate belong to my wife and that my daughter Rhoda be supported out of it during her insanity. Provided my daughter Rhoda shall come to her right mind my will is that she be made equal with the rest of my children at that time. And at the death of my wife Share one equal portion with the rest. Item 5th. My Will further is that at the death of my wife my estate be equally divided amongst my children. Item 6th. I appoint my Son Burgess Gentry and Pinckney F. Rainwater executors of this my last Will and Testament in witness whereof I hereunto Set my hand and Seal this the eleventh day of April in the year of our Lord one thousand eight hundred and thirty five. © 2017, W.M. Gentry - All rights reserved. This article may be reproduced in whole or in part for non-commercial purposes provided that proper attribution (including author and journal name) is included.